An Artist’s Journey to be held from 2nd – 26th May, 2018 at the Barbican Library, Barbican Centre, London. This is Mike’s 3rd solo exhibition; his second at the Barbican. All the paintings are new work. We are delighted to announce that the Maritime Archaeology Trust will be exhibiting some of the work Mike has done for them in his role as Artist-in-Residence. Mike exhibited one painting at SGFA Draw 16 – 95th Annual Open Exhibition which ran from 3rd – 15th October 2016 at the Menier Gallery, 51 Southwark Street, London SE1 1RU. 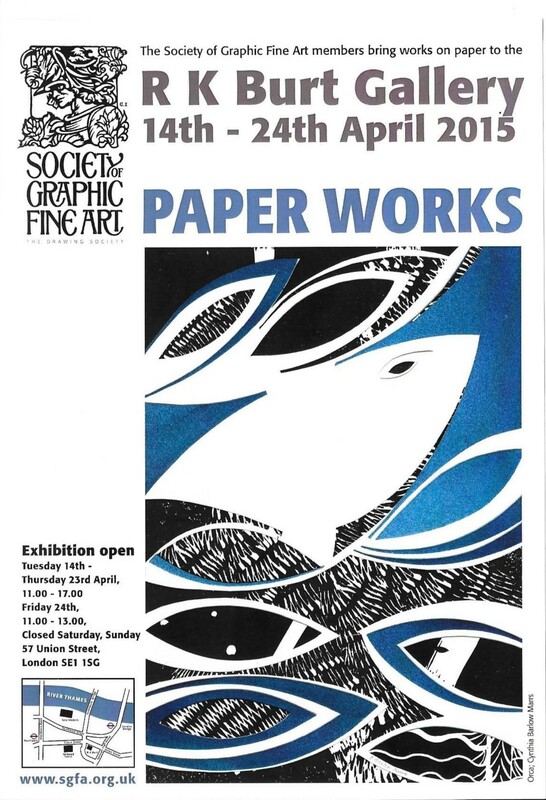 Society of Graphic Fine Art Paper Works Exhibition 16 – RK Burt Gallery London ran from 4th – 15th October, 2016. 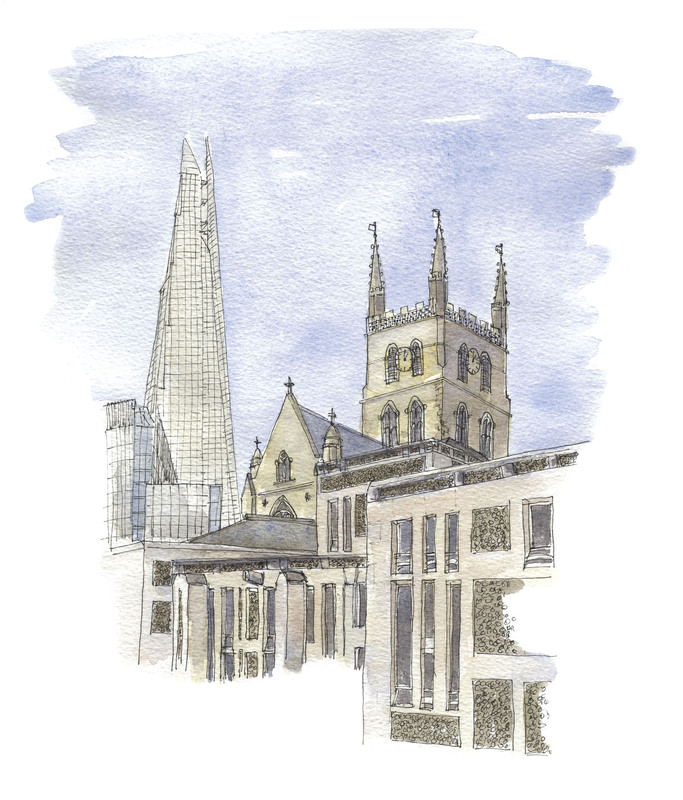 This successful exhibition ran from 4th – 31st July 2015 and included new pictures of London, around Southwark and beyond. 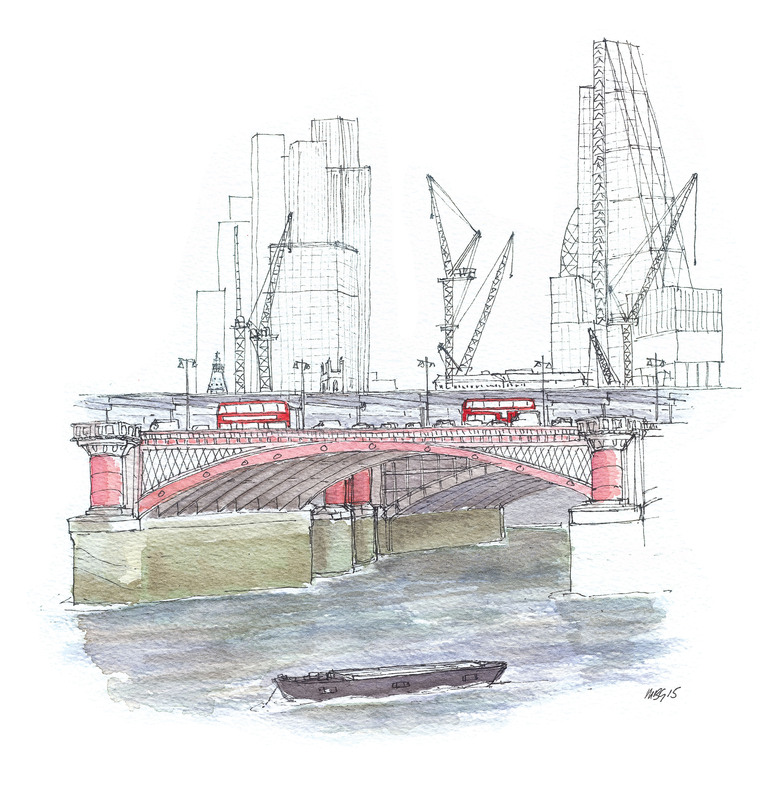 Mike’s first solo exhibition which was held in the Barbican Library, Barbican Centre, Silk Street, London EC2Y 8DS and ran from 4th – 30th June 2014 was a great success. Our thanks to everyone who supported us by visiting the exhibition. It was an amazing month for both Mike and Kate. The Private View was a great success with over 50 people attending, and we were delighted to catch up with so many old friends and to meet new people who enjoyed both the pictures and the book. I can recommend a visit to view Mike’s artwork. 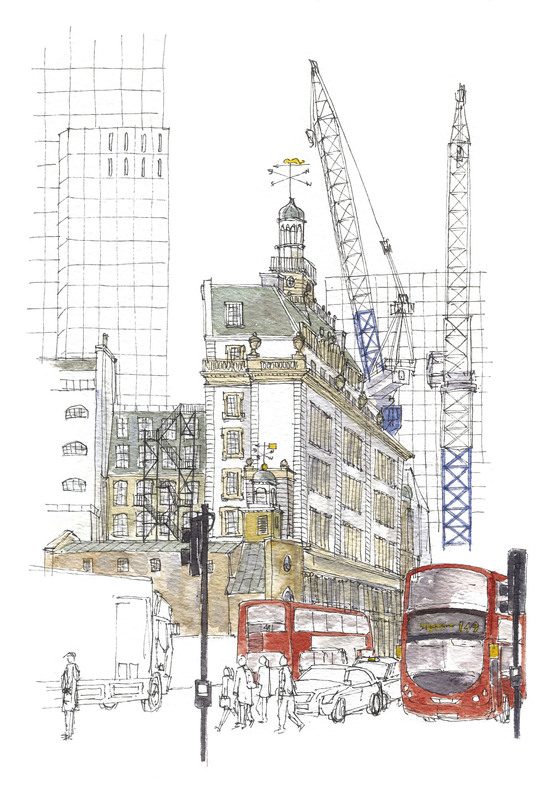 His style is interesting in the way he extracts a scene that provides interesting architectural contrasts. Also, highlighting specific detail that can so easily be missed by the passer-by. Many of the pictures are captured in the book Rambling About London and this would make a great present for all London aficionados.